IPS PREMIUM CHAT: Talking ALPHA WOLF at 6:15pm! 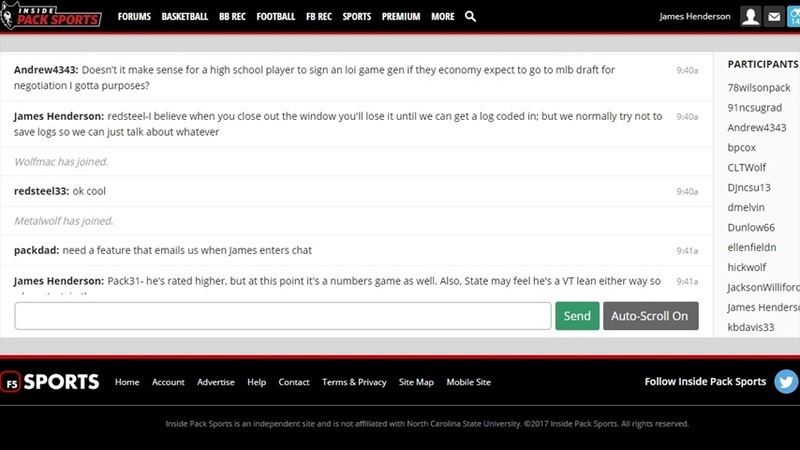 One of the main features we've wanted to provide our subscribers is a functional chat room, and we're going to use the IPS Chat Room for some of our 2018 camp coverage! TODAY we will be holding a Premium Chat that begins at 6:15PM EST and will span the Alpha Wolf Showcase. IPS Publisher James Henderson will be in the chat answering questions from subscribers while also providing minute-by-minute camp updates so make sure you stop by! We will primarily talk about football recruiting, but James will answer any other questions you want to discuss on Wolfpack athletics! Click HERE to subscribe to Inside Pack Sports!